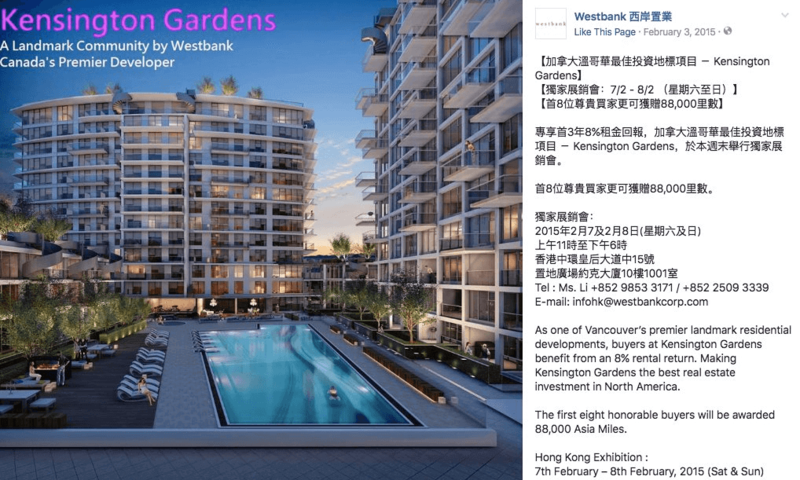 There’s been plenty of debate over Vancouver pre sales condos being flogged overseas before most local buyers can get their foot in the door. While there’s still no official data, evidence is mounting of offshore investment in pre sale condos. While locals might eventually end up as the end consumer, the question becomes how many will be left empty and what is the impact on prices when flipped (assigned) shortly after. A recent development from WestBank called Kensington Gardens highlights this growing trend of assignments. Facebook advertisement from Westbank business page. Currently there are 65 assignments (some sold, some still active) of the total 404 total units in the development. That equates to 16% of the building being flipped before completion which is still one year away. I would expect the number of assignments to continue growing as the building nears completion, particularly if foreign buyers want to avoid the 15% foreign buyers tax upon closing. With the developer charging a 1.5% fee on each assignment it’s a lucrative deal for both sides. With pre sale prices now hitting $1500/ foot in projects like Joyce the debate wages on if new supply is helping with affordability and who these projects might be selling to. The counter argument is foreign buyers are helping fund new supply, as most developments require 70% of the building to be ‘pre sold’ in order to qualify for Canadian financing- thus a quick sale overseas makes life easy. Not to mention foreign buyers assume all the risk involved with pre sales. Then again, with Vancouver experiencing a full blown housing crisis, coupled with a pent up frenzy of local demand, one could argue there should be more regulation or government incentives to ensure projects are sold locally while discouraging speculation in new condo developments.